I will chronicle the build of my 1947 Autocar U-70 here. This story starts in about the year 2000. This project started because of a need/desire to haul my street rod, other projects, parts cars, etc. As the planning of the new project progressed, I realized that a tow vehicle might be better that a hauler with a flat bed. As a tow vehicle I could take it to shows by itself, I could pull a car trailer, or I could pull the travel trailer that was creeping into the picture as something my wife and I wanted to do after retirement. At this point I didn't have a specific make/model of vehicle, but knew I wanted a COE of 1948 or older vintage. (many larger car shows have a 1948 or older requirement for entry) Also, I wanted my truck to be something unusual, not the fairly common Ford or Chevrolet of the late 40s, or early 50s. I had seen an early 40s Studebaker and liked the rareness of it, but not enough to search for one. I had access to a Divco that wasn't old enough, but because it used a body style that preceded the 1949 model year, would meet my criteria. I don't know why I didn't pursue this route and knowing then what I know now that they did produce a very few refuse trucks with a "normal' cab I probably would have. 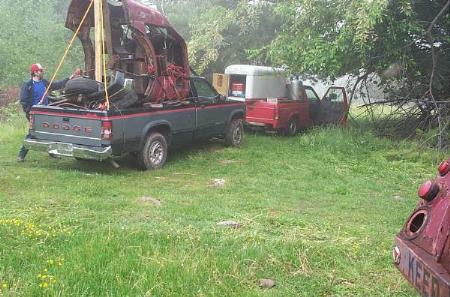 In the spring of '04 while searching Ebay late one evening for parts for my daily driver Dodge Dakota, I found a complete Dakota parts truck in Connecticut. Great, I'm not going to drive a thousand miles for a late model parts truck, but then I clicked on what else the seller had for sale. Listed for a starting bid of $50 was the ugliest COE I had ever seen. I had heard of Autocars, but never an Autocar COE. In the morning I showed the listing to my wife, her response was "that's the one isn't it". Great, no negative response from her was a "go ahead" for me. A week later, after a last minute bidding war, it was mine. During the week that the auction was active on Ebay, I racked my brain as to how to get it home. I had no way to haul it, I had no friends with equipment and no money to pay someone the going rate to haul it a thousand miles. Remember the Dakota parts truck? I got to thinking about buying it and towing it home with my Autocar (just the cab and fenders) in the box. Two birds, one stone done deal! The Dakota auction ended 10 minutes after the Autocar, so when one ended I spiked the other and ended up paying $102.50 for all the Dakota parts I needed, plus a way to haul my truck cab home. 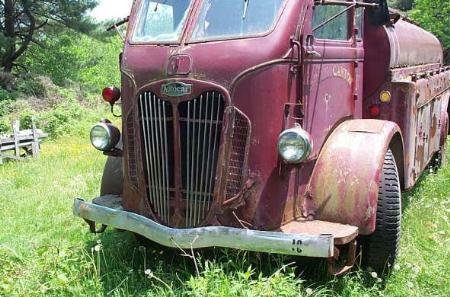 I called the owner and got permission from him to dismantle the truck in his yard, made a custom tow bar that bolted to the Dakota frame, loaded all the tools I could possibly use into my pick-up, recruited my brother, and set out for Connecticut. Here are pictures from our first meeting. Steve, I think I am going to like hearing the rest of your story. I'm wating with bated breath. Democracy is two wolves and a sheep voting on what to have for dinner. A Republic is a well-armed sheep. A rough drawing of my project. 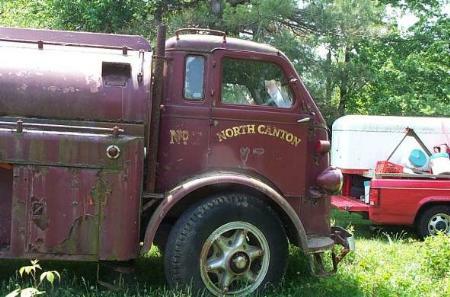 1947 Autocar U-70 cab set on a 1980 International frame with fabricated air suspension, Detroit 6v53T engine and Allison 2400 transmission. The engine will sit under the sleeper cab with a small dog house in the front of the cargo area. I plan to have a 5th wheel mounted in the cargo area to pull a large travel trailer. Sorry, I don't have a closer picture from this view. This is the rear suspension in full compression, rear rear axle is chained up as high as it will go, front rear has all air out of bags. Notice the small air bag that is used to raise the front rear axle off the ground. All suspension links are parallel with the ground at ride height. I don't know if that is best, but it was simple to keep track of. This is an overhead view of the rear rear suspension. The upper arm is triangulated to a bridge above the center chunk. I used a bridge because I didn't want to weld to the cast iron center chunk, the nickel rod required is expensive and cast iron welding it not my area of expertise. Upper and lower arms are made of 2"X3"X1/4" wall mild steel tubing. The upper bag mount is 5/16" plate steel, it is bolted to the frame. If you look carefully at the upper bag mount you can see a vertical relief cut and welded in the frame for bag clearance, there is also a "C notch" cut in the bottom of the frame so the frame can be lower. An in process picture of the rear rear lower control arm frame mount. All mounts are bolted to the frame. An overhead view of the trailing arm axle mount, on the front rear axle. Two bushings in tandem to resist rotation, but somewhat compliant to twisting forces. The arch in the front rear axle for drive shaft clearance. (unfinished) 4"X4"x1/2" wall tube. I somehow need to attach a panhard bar to this axle, but it can't interfere with the drive shaft. Not sure how I will do it. Overhead shot of my steering set-up. I used the steering box that was on the fire truck. The steering box and drag link are at a 30 degree angle to the axle. Originally this axle was a normal cross steer set-up so I didn't have to change any of the original tie rod parts. the drag link will be stretched about 3"
These are the original suspension arms and axle attachment from the 1997 1 ton 4wd Dodge dually. I carefully measured the original truck so the arms are located the same as they were from the factory. The mount that attaches them to the frame got a little tricky and took a couple of tries, but I'm happy with the way they turned out. 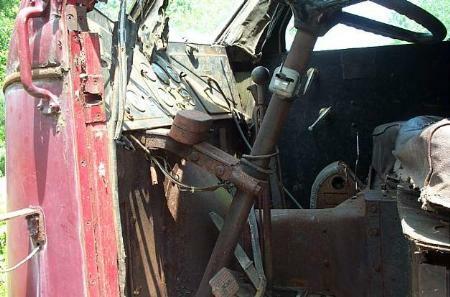 The panhard bar isn't shown in the picture, but it also mimics the original using the same axle mount. It isn't noticeable in this picture but this was a driven axle (4wd) that I removed the center chunk from and replaced with a heavy walled tube. I got a real good deal on the front and rear axles on Ebay and not needing or wanting a 4wd this seemed like the easiest way to proceed. A close-up of the lower bag mount on the front axle. The original Dodge suspension used coil springs, I modified the spring holder with a flat plate to hold the air bag. Very simple conversion. Notice the splice in the axle tube just to the frame side of the spring mount, the rusty piece is slid over the original tube 4" and the joint has 8 1" plug welds joining the 2 tubes. Another update! I have finished the sleeper/engine cover framework today. 36"X80" wide. Crawl thru area is 60" wide X 28" high. Obviously the lower center area will be filled with engine, but the 2 lower side compartments will be unique. Drivers side will house a built-in tool chest that will be made in such a way so that the contents can't spill out when the cab/sleeper is tipped. Passenger side will house a small "kitchen", complete with cook stove, sink and running water, to comply with licensing requirements for RV registration. All corner radii are 8", this matches the original cab corners which won't be used now. Door for sleeper compartment on passenger side only. This shows how I made the curved sections. 2 pieces cut to the correct inner and outer radii with a 3/4" wide strip bent to fit and welded corner to corner on the outside radius, giving a 1" X 2" U shaped section laying on its side. This is all fabbed from 1/8" plate X 26 places. My little hand-held plasma cutter got a workout. Complete frame weighs less than 200 pounds. As always, questions, comments and constructive criticism is welcome! Great work so far. I have to take a second look everytime I see "North Canton" on the Acar. I live in North Canton too, just Ohio instead of CT. I'm no expert, but I did stay at a Holiday Inn Express last night. Had a laugh the other day, my daughter came over and saw the frame outside the garage. She said it would make a great "jungle gym" for "X", (her son Xavier) I could bring it over to her house anytime. I've spent the last 2 days setting things up and making a pattern for the roof spars. I had this part of the project finished several years ago, but decided to lengthen the cab a few inches, so I had to start over. Another update! Last time I said I would be moving on to the cab structure, that is pretty much complete now. Next, I was going to redo the door structures. (remake frames from steel tubing) That ain't going to happen right now, I took one apart and using steel tubing appears impossible, so I put the doors to the side while I think of a new way to remake them. (Discretion is the better part of valor) I'm starting to do some of the sheet metal work now. Hammer forming works! Over the winter, I made a hammer form for the windows in the new part of the cab and the sleeper. 1" aluminum plate, table saw, router and lots of real precise measuring. Yesterday and today I tried it out. This is the first time I've tried this method for forming/working sheet metal and I think it came out well. By the time I get the other 3 panels made, I should have it figured out. and glued to the inside lip, so it will be easy to cover up the repair. My attempt to anneal the corners didn't seem to make any difference to how the metal stretched. I heated it to a dull red in dim light then let cool. I didn't want to use too much heat for fear of shrinking where I needed to stretch the metal. Trial fit! This will be a non opening window (much easier) between the door and the sleeper, passenger side. As always, questions comments and constructive criticism is welcome.